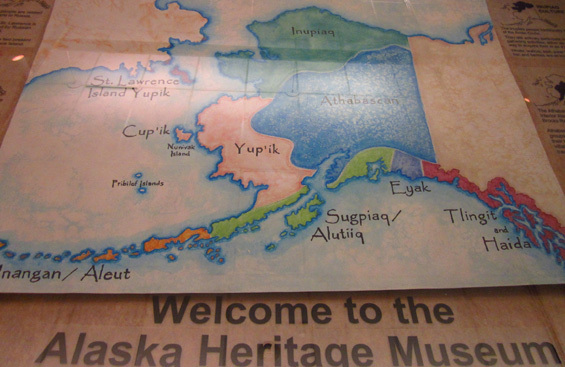 Alaska history and culture with residents and visitors." 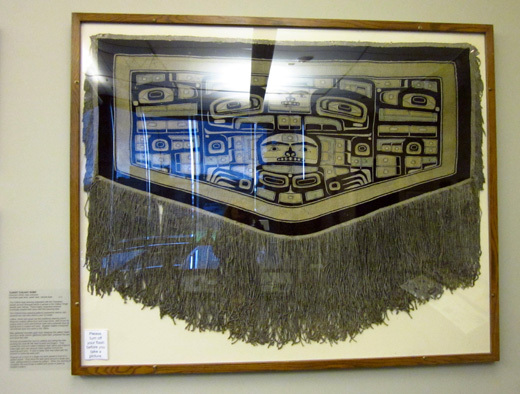 Our fifth stop in Anchorage today was at a beautiful free museum featuring Native Alaskan art and culture in the Wells Fargo building at 301 W. Northern Lights Blvd. (at C Ave.). 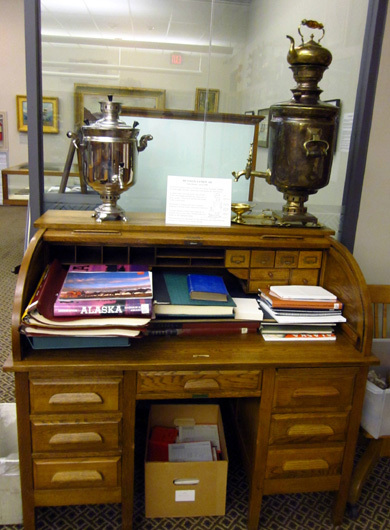 It is called the Alaska Heritage Museum. 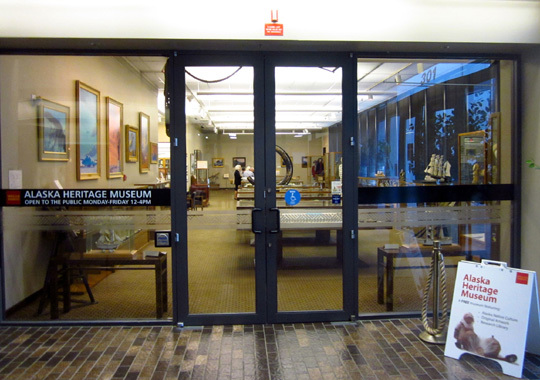 The entrance to the museum is in the lobby of the Wells Fargo building. 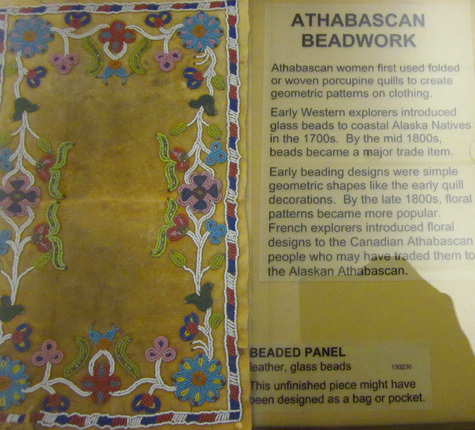 We were impressed by the scope and beauty of the displays of over 900 works of art and Alaska Native cultural objects, from traditional to the contemporary. 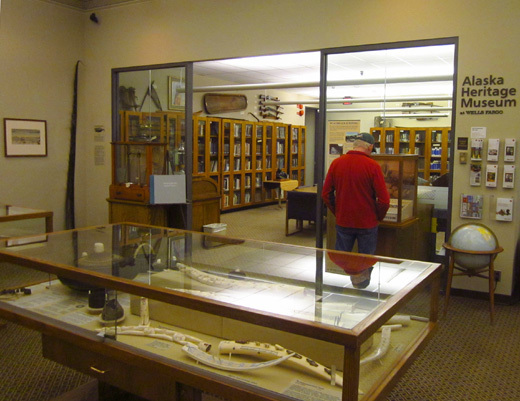 Jim browses in the museum's library. 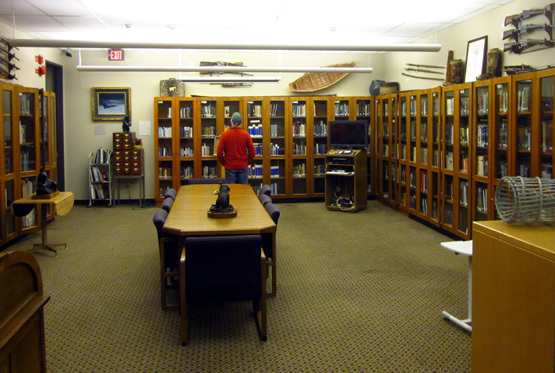 and a library that includes more than 3,600 volumes on Alaskan history. Scientists have determined the tusk is between 12,000 to 15,000 years old. I enjoyed reading the history of these prehistoric animals. Briefly, during the last Ice Age sea levels dropped and a land bridge called Berengia connected Siberia with Alaska, allowing wooly mammoths, Yukon horses, American camels, saber-tooth tigers, and short-faced bears to cross into North America. 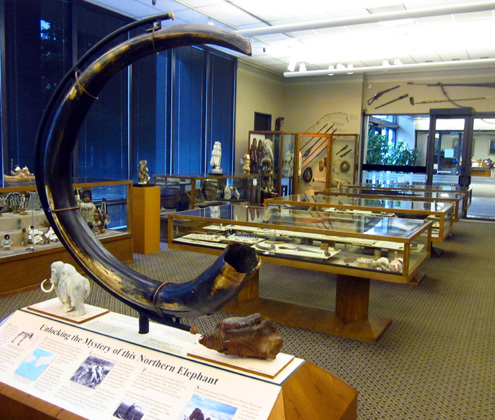 Early humans, including Native Alaskans (who also crossed Berengia), used mammoth tusks and bones to make tools, houses, musical instruments, beads, and carvings. The original mammoths went extinct about 10,000 years ago at the end of the Ice Age (you think we have global warming now??). Because of its cold climate, however, dwarf wooly mammoths continued to live in parts of Alaska until as recently as 3,700 years ago. 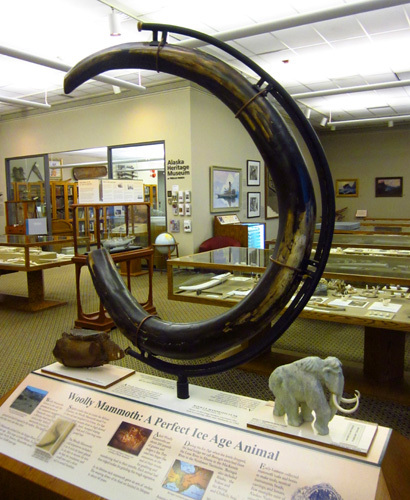 The mammoth display also describes modern scientific projects using sequenced DNA from prehistoric wooly mammoths unearthed from permafrost. It's all very interesting. 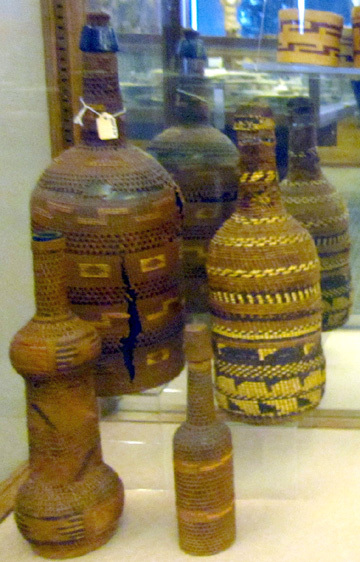 Quite a few woven baskets and covered bottles are displayed. 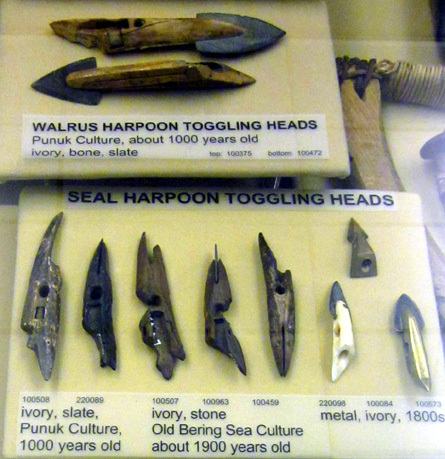 Just look at those tiny carved seals, walruses, and fish! Also note the paintings hanging on the wall. 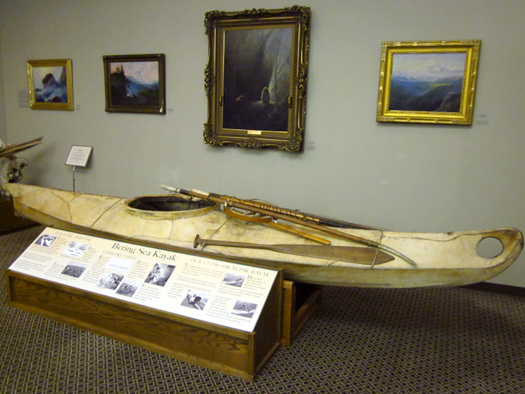 This kayak is shorter and heavier than many used by Native Alaskans. 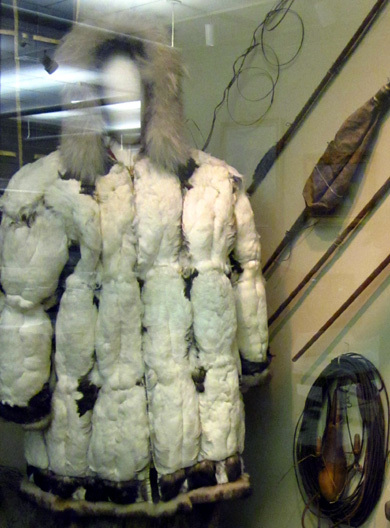 It is built of driftwood and sealskin and large enough to hold two people and carry a sled to make it easier to transport across ice. 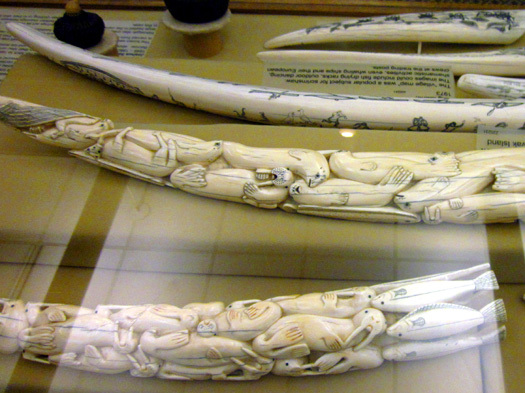 In use for approximately 4,000 years, kayak styles varied widely across the different cultures of Arctic Alaska. Though gradually replaced by motorized boats, kayaks were still in limited use in the 1970s. Their current revival is a symbol of cultural survival. It's pretty obvious how important kayaks would have been for survival in remote Alaskan villages. It was also interesting to learn that a man's kayak was his most prized possession for some additional reasons. It also helped him attract a wife, support his family, and accumulate wealth! That makes sense. Historically a great deal of ceremony, ritual, and attention to strict rules went into its construction and boys learned from an early age to hunt from a kayak using a harpoon or darts to gather food from the water. It's a tradition that some Native cultures are trying hard to maintain in this increasingly technological world. warm, waterproof, and more durable than it looks. 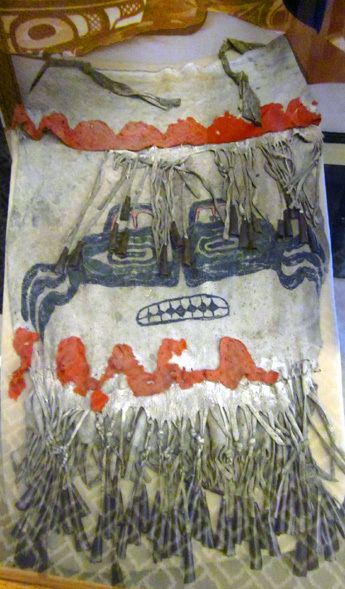 Per the interpretive information provided nearby, "Shamans often wore special decorated clothing during spiritual rituals. The designs might protect the shaman or represent a spirit helper. The rhythmic beat of the metal gun cartridge charms bumping against one another might summon the shaman's spiritual assistants." 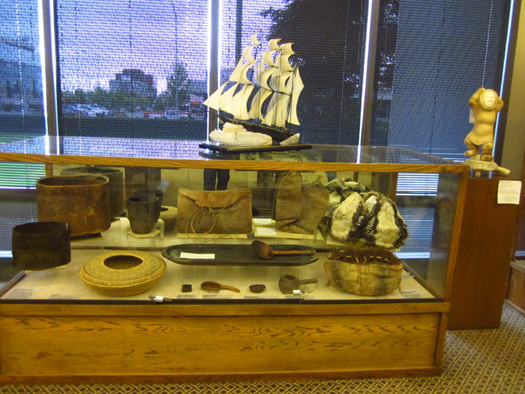 A smaller section of the museum features Alaska's mining history, something Wells Fargo was involved in. An investor bought the large nugget for $4,000. 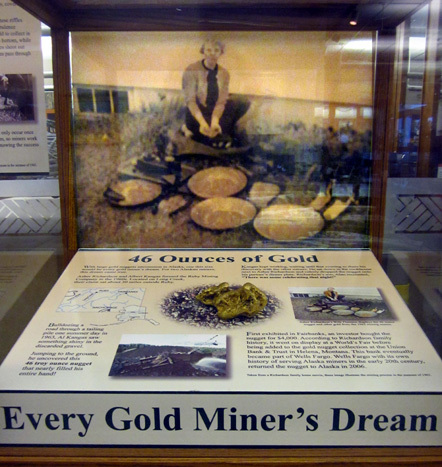 After it went on display at the World's Fair it was added to the gold nugget collection at a bank in Montana that later merged with Wells Fargo. Wells Fargo had its own history serving miners during the Gold Rush in the early 1900s. 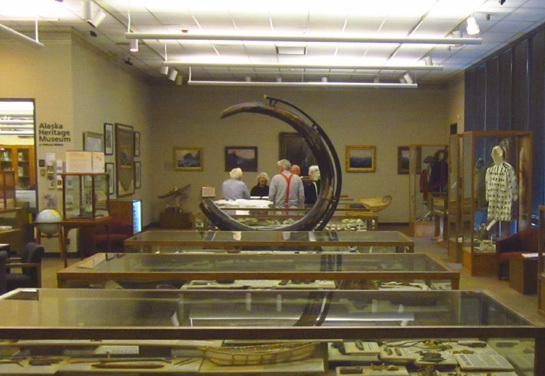 I don't have a picture of it but there is a two-thirds scale Wells Fargo stagecoach from the Alaskan Gold Rush era on display at this museum. Wells Fargo returned the nugget to Alaska in 2006 and you can now ogle it here. It's worth a lot more than $4,000 now . . . I suppose it's one of the duties of the museum's affable curator to keep an eye on that nugget. When the other couples left Tom gave us his full attention for about 30 minutes, answering all of our questions and providing additional historical information that was very interesting to us. Samovars are large metal containers used to heat water, usually for tea. We thoroughly enjoyed this museum and highly recommend visiting it. Parking and admission are free. 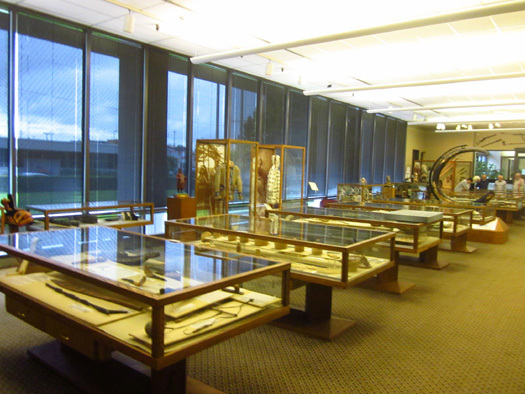 The museum is on the first floor of the Wells Fargo building and is open on weekday afternoons. 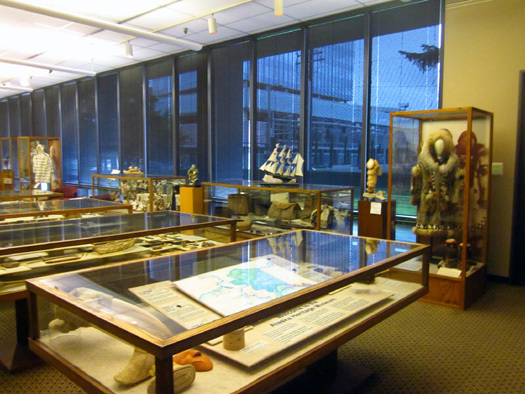 We were surprised to learn that Wells Fargo has ten other historical/cultural museums around the country in Charlotte, Los Angeles, Minneapolis, Mobile, Philadelphia, Phoenix, Portland, Sacramento, San Diego, and San Francisco. I've been in every one of those cities in the last three decades but had no clue about the Wells Fargo museums. You can find information about those locations at the links above. Whew! We did a lot today. 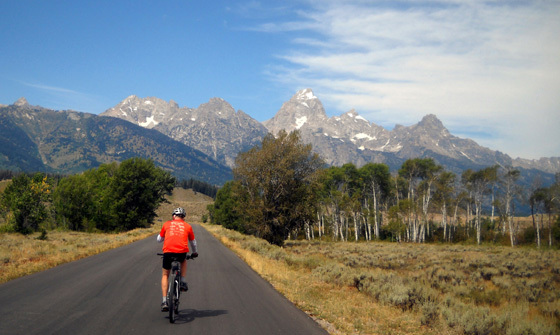 Unless it's poring down rain tomorrow we plan to ride our bikes on the popular Tony Knowles Coastal Trail, a paved multi-use path along Anchorage's waterfront.